The WDC recently presented to Galway Chamber, noting some of the work they have recently undertaken and highlighting some policy implications for the Region as well as the city. Galway city and its reach goes well beyond the city boundary, but measuring this is complicated. In part because there are different measures depending on the role performed by the city, for example as a centre of excellence for health it has an extensive regional remit. More recently there is consideration of the Galway Metropolitan Area Spatial Plan (MASP) as part of Ireland 2040 and the National Planning Framework. Another way of examining the impact and influence of Galway is examining its labour catchment. The WDC has analysed labour catchments, based on Travel to Work Areas, which in turn are based on the commuting patterns of workers resident in the Western Region. The WDC first undertook this exercise based on Census 2006 data and has completed the same analysis 10 years later with the most recent Census in 2016. 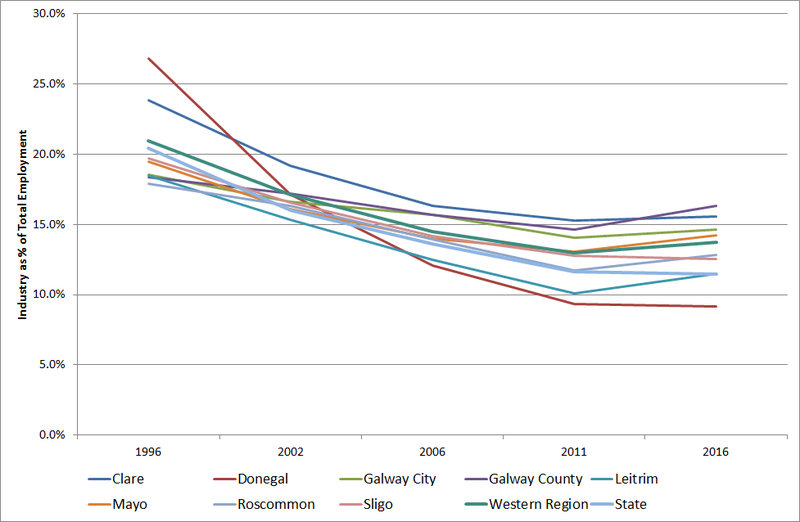 This provides useful trend data, which shows a growth in the size of the Galway city labour catchment over the period. The Galway city labour catchment and the extent of commuting to the city highlights the extensive reach of the city across the entire county and beyond into parts of Galway and Mayo. The recent Census data shows that between 2011 and 2016 the number of people living in Galway city grew by over 4% (4.2%), and by 2.4% in County Galway. Both the city and county had much higher population increases than anywhere else across the Western Region, (Mayo and Donegal recorded slight declines). When examining the socio-economic profile of residents, the figures for Galway city are generally very similar to the state average, for example, in terms of the employment (53.4%) and unemployment rates (7.9%) and the share not economically active (38%) the Galway city figures and the State are the same. There was a discussion on the National Planning Framework and the Northern & Western Regional Economic and Spatial Plan. While the NPF is to be a move away from ‘business as usual’, from a regional perspective the focus is on the five cities. A concern is implementation and the importance of sectoral policy as an instrument of change for both capital & current spending. Sectoral polices need to be aligned to support the move ‘away from business as usual’. However, there is little evidence of this in the NPF, so for example, policies such as the National Aviation Policy devised well before the NPF now need to be reviewed to support the regional population and employment targets. On the Northern & Western Regional Economic and Spatial Plan, while the WDC welcomes regional population targets there needs to be more commitments to help deliver. There is much potential in the regional centres but there needs to be better links and investment, however much of this is at the back end of the programme rather than being front loaded. As we know from previous spatial planning exercises (e.g. National Spatial Strategy), implementation is key. What happens if priorities of a Government Department or sectoral agency conflict with RSES? Better intra-regional transport links e.g. M18 have extended labour catchments & opened up new opportunities, for example there is now more commuting for work between Galway, Ennis, Shannon and Limerick. This can be a key asset for large employers looking to access the skills they need. The Galway-Ennis-Shannon- Limerick may currently be the most cohesive element of the Atlantic Economic Corridor and it illustrates how good transport links are critical. Employment and good job opportunities are important in ensuring skilled people will stay in the region and Galway needs to attract new and dynamic enterprises. Employment is very important but Galway as a place to live is equally, if not more important. Place of residence is usually more stable than place of employment, therefore retaining the good quality of life available in Galway and improving on it should also be a policy priority. The idea of the regional cities working together more cohesively was a key theme discussed at the conference on urban development hosted by the Chambers of Commerce in the five cities – Cork, Dublin, Galway, Limerick and Waterford, held in NUI Galway on 28th March. The conference, entitled ‘Ireland’s Cities – Powerhouses of Regional Growth’, explored how Ireland’s five cities can fulfill the goals of economic development for their regions set out in the National Planning Framework (NPF) and Project Ireland 2040. The Minster for Housing, Planning and Local Government, Eoghan Murphy TD, opened the conference and welcomed the initiative, pointing to the opportunities for urban growth and regeneration without urban sprawl. John Moran, Chair of the Land Development Agency pointed to the opportunities for the four regional cities to work together to create a counterbalance to the East and to combine capacities to create more opportunities. Other speakers included Anne Graham, CEO of the National Transport Authority. John O’Regan, Director of AECOM discussed the results of their Survey on Our Cities’ Infrastructure Needs and Dr. Patrick Collins from NUI Galway discussed a Vision for Galway as an example of urban regeneration highlighting issues and opportunities. The presentations will be made available on the Galway Chamber website shortly. https://www.wdc.ie/wp-content/uploads/industry-top-employment-sector-600px.jpg 177 500 WDC https://www.wdc.ie/wp-content/uploads/wdc-567.png WDC2019-02-27 10:56:282019-03-01 10:08:49How important is Industry as a regional employer? Happy New Year from the WDC Policy Analysis team! As we all try to settle back into work and look forward to 2019 (well as much as anyone can with Brexit looming large on the horizon) it’s a good chance to look back at the year that was 2018. In May, we published detailed analysis of the travel to work patterns of workers living in the Western Region. The analysis, undertaken by the All Island Research Observatory (AIRO), identified 42 labour catchments across the region. Further analysis of 26 smaller labour catchments will be published later in January. During 2018 we continued to publish succinct, 2-page WDC Insights on a range of issues including Electricity Transmission for Renewable Generation, Enterprise in the Western Region 2016, County Incomes in the Western Region, Growth and Change in Regional GVA and Education Levels in the Western Region. October 2018 saw the launch of a series of Regional Sectoral Profiles of economic sectors in the Western Region, analysing the latest employment and enterprise data and drawing out key policy issues. A detailed report and WDC Insights summary is published for each sector. The first examined was Wholesale & Retail which employs just over 42,000 people in the Western Region, this was followed by Health & Care which employs a similar number. The next in the series, on the Education sector, will be published later in January. One of the big work areas in any year is making submissions to national and regional policy consultations and 2018 proved particularly busy on the submissions front. The year kicked off with submissions on the Issues Paper published for both the Northern & Western and Southern Regional Spatial and Economic Strategies (RSES). Following the consultation period in early 2018, the Draft RSES documents are currently open for public consultation and we’ll be updating on the WDC’s submissions shortly. Other submissions during 2018 included EirGrid’s Electricity Transmission Development Plan 2017-2027, Seanad Consultation on SMEs and the National Digital Strategy among others. We continued to post an (almost!) weekly blog throughout the year with posts on all of the above publications, outputs and activities. Other topics ranged from Nuts about NUTS and How many farmers are in the Western Region? to Leprechauns in Invisible Regions, Caring for the West and Is e-working on the increase? To keep up to date with new WDC Policy Analysis outputs published during 2019, sign-up to our Mailing List. To receive our weekly WDC Insights Policy blog by e-mail, follow the blog. And to follow us on Twitter we’re @WDCInsights. Looking forward to working with you in 2019. 42,510 people were employed in the Wholesale & Retail sector in the Western Region in 2016. At 12.7% of total employment, it is the region’s second largest employment sector, after Industry. It is somewhat less important in the region than nationally (Fig. 1). At 13.3% of all employment, it is Ireland’s largest employer. Among western counties, Wholesale & Retail is most significant in Mayo (14.4%) and least so in Clare (11.2%). Two other largely rural counties (Roscommon and Donegal) had the next highest shares working in the sector in the region. Wholesale & Retail accounted for a higher share of total employment in 2016 than a decade earlier in all western counties (except Donegal) and most notably in the most rural counties. 52.3% of people at work in the Wholesale & Retail sector in the Western Region are male, similar to the national average. Males make up the majority in all western counties (at 55.2% Sligo has the greatest male majority) except Clare (50.8% female) and Galway city (50.9% female). Wholesale & Retail is the largest employment sector for 16 out of the region’s 40 urban centres. There is no clearly discernible pattern in the relative importance (as a percentage of total employment) of the sector across the 40 towns, ranked by descending size (Fig. 2). Factors such as location, distance from larger urban centres, diversity of its economic profile and alternative job options combine with a town’s size to determine the role played by the sector. Boyle (20.2%), Ballina (20%) and Castlebar (19.1%) have the highest shares working in Wholesale & Retail in the region. These, and other towns with a high share, are important rural service centres located quite some distance from larger centres and serving wide rural hinterlands. The sector is least important for Strandhill, Newmarket-on-Fergus and Moycullen; all are towns located close to large urban centres which are likely their main retail centre. The Western Region is characterised by greater self-employment in Wholesale & Retail than the national average (15.5% of total employment in the sector is self-employment compared with 12.7% in the state). Every western county, except Galway City, also has an above average share of self-employment, meaning the sector in the region is characterised by more family or owner/ manager run businesses, likely smaller in scale. The share of self-employment declined in all western counties (except Sligo) between 2011 and 2016. This indicates a changing composition of the sector with fewer family or owner/manager run Wholesale & Retail businesses and the expansion of multiples and chain stores with a growing share of those working in the sector being employees. Census data on employment in the Wholesale & Retail sector is sub-divided into 17 separate activities. For ease of presentation here these are grouped into five broad areas: Motor trades; Wholesale; Food/beverage retail; Clothing/footwear retail; and All other retail. In 2016, the largest sub-sector in the Western Region was ‘Food/beverage retail’ (Fig. 3) accounting for 27.7% of all employment in the Wholesale & Retail sector. The largest element of this is supermarkets. The next largest sub-sector is ‘All other retail’ (e.g. furniture, computers, petrol stations etc.) followed by ‘Wholesale’. The relative importance of the five sub-sectors differs across counties. Generally, ‘Food/beverage retail’ is the largest with close to 30% working in this sub-sector in Clare and Leitrim. Two exceptions are Galway City and Roscommon where ‘All other retail’ is bigger. The sub-sectors have performed differently over time. For the Western Region, ‘Motor trades’ saw the most significant jobs growth between 2011 and 2016 reflecting strong recent growth in car sales and recovery from substantial job losses during the recession. ‘Clothing/footwear retail’ was the only other area to show some growth with the other three sub-sectors declining in the region. This is in contrast to the national picture where all sub-sectors grew except ‘Food/beverage retail’. Increased consumer mobility & rural areas: The trend of travelling to large urban centres to avail of wider retail choice presents opportunities for the region’s largest centres but may have negative consequences for small and medium-sized rural towns. Town centre renewal: Towns are trying to adapt to their changing role. Retail is just one of the services they provide and for many it is declining in relative importance. Taking a broad approach to town centre renewal is critical to making towns more attractive retail and service destinations. Growth of online sales: Online sales continue to grow but the majority of spending leaks out of Ireland. While online can be seen as a threat to traditional retail, it also presents an opportunity to expand beyond local markets. Declining self-employment: While self-employment remains higher in the region than elsewhere, it is declining. Fewer family or owner/manager run enterprises impacts on the local distinctiveness of the retail offering of individual towns. Quality of employment and skills development: While Wholesale & Retail offers many high quality jobs, it also employs a lot of younger and lower skilled workers. Improving the quality and security of jobs in this sector is important for worker rights and also for the sector’s ability to adapt to emerging trends. Opportunities exist to grow online activity and to restructure the retail and service offering of towns to meet changing consumer needs. However, grasping these opportunities will depend on proactive policy to support the sector, a willingness to adapt among retailers, increased capacity for businesses to compete with larger national or global retailers and a collaborative approach to help towns adapt to their changing function. Appendix 1 of the report provides data for all 17 activities. https://www.wdc.ie/wp-content/uploads/wport2.jpg 580 1030 WDC https://www.wdc.ie/wp-content/uploads/wdc-567.png WDC2018-10-24 13:00:102018-10-18 16:31:31How important is Wholesale & Retail in the Western Region? The Western Development Commission (WDC) has just published a series of eight infographics showing of key statistics for the Western Region and each of its seven counties. The data is from the CSO’s Census of Population in 2016 with analysis by the WDC. The percentage living in rural areas. There is a different infographic for each county and there is also one for the Western Region. The Region’s infographic shows the Western Region population growth since the last Census in 2011 (1.0%) and the growth over the last ten years (8.7%). The Region has more females (50.4%) than males and that 15% of the population are over 65 and more than a fifth are under 15 (21.1%). Infographics are an entertaining way to provide information about the Region and its counties. They show important county characteristics and information in an accessible and lively way. We hope they will be used in schools and in workplaces and anywhere that people want to know more about the places where they live or are visiting. There is a good mix of statistics highlighted on the infographics, showing access to broadband in the Western Region (64%) and also that most of the population consider themselves to be in very good health (57.6%). The infographics also give information about work and education. In the Western Region the average time taken to travel to work is 24.8 minutes. 59% of the working age population is in the work force and 39% have a third level qualification. Two employment sectors are also shown. 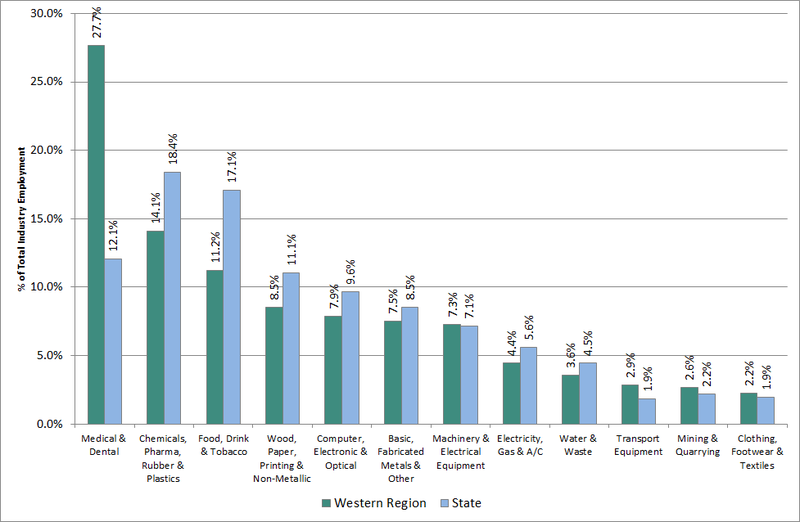 Almost 14% of the Region’s workers are in Industry and 6.8% working in agriculture.